The Engine House Museum is one of the few places in New Zealand where steam engines can be seen in their original workplace. 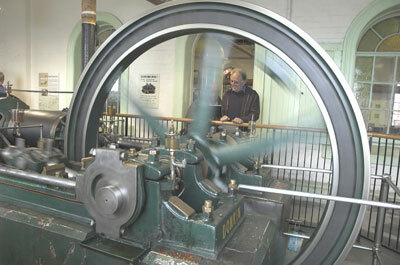 The collection ranges from an 1860s beam engine to a 1960s Reader vertical engine. Most are in full running order. The earliest steam engines were steam powered pumps used to remove water from deep mines in England. These engines had a vertical cylinder, which operated the pump by means of a beam pivoted in the middle. One end of this beam was connected by a chain to the piston, and the other end was connected directly to the pump rod. Steam was admitted to the cylinder below the piston, which rose due to the weight of the pump equipment on the other end of the beam. A spray of cold water was then admitted to the cylinder, which condensed the steam and created a partial vacuum. Atmospheric pressure then pushed the piston down, which in turn raised the pump rod, operating the mine pump. These engines were developed by Thomas Newcomen in about 1712, and were known as "atmospheric engines" due to their use of atmospheric pressure. A major step in the evolution of the steam engine was the development of the rotative engine, which transferred reciprocating motion to circular motion (driving a flywheel). The first such rotative beam engine was made by James Watt, and his engine was in many ways basically similar to the beam engine on display here. James Watt was also the first person to use the pressure of steam to push the piston in the cylinder. By admitting steam alternately to each end of the cylinder he created a double acting engine that was far more powerful than the old atmospheric engines. Watt also invented a system of linkages to connect the end of the piston rod, which must move in a straight line, to the end of the beam which travels in an arc. This linkage was known as "Watt's parallel motion". This parallel motion gear used a pivoted arm that described the opposite arc to that of the main beam, which cancelled each other out, and the piston rod travelled in a straight line. The development of the steam railway locomotive did much to stimulate the technological progress of the stationary steam engine. Cylinders were mounted horizontally rather than vertically, and accurately engineered mechanical guides and linkages allowed the piston rod to be attached directly to the connecting rod which in turn drove the flywheel. The steam engines which drove the Waller Exhausters and the Bryan Donkin Booster are examples of this type of engine. Other horizontal engines in Dunedin powered the Roslyn Woollen Mills, the Rattray Street and Stuart Street Cable Cars, and the Crown Roller Flour Mills, as well as many other industries where small electric motors would be used today. Vertical steam engines where the cylinder was mounted above the crankshaft were also widely used, the Reader Exhauster engine being an example here. This engine is com¬pletely enclosed like a diesel engine, and the moving parts can not be seen. Propeller driven steamships were powered by vertical steam engines, SS Earnslaw on Lake Wakatipu being New Zealand's best known example. The Bryan Donkin Booster was used when demand was high to ensure an adequate supply of gas to the outer areas of the city. When demand was low electric boosters were adequate. Late at night the pressure within the gasholders was enough without boosting. The Bryan Donkin is a horizontal, steam driven, duplex reciprocating compressor capable of passing 100,000 cubic feet of gas per hour at a pressure of 5lbs per square inch. It was manufactured by the Bryan Donkin Company Ltd. Of Chesterfield, England, and was installed at the Dunedin Gasworks in 1926. The no. 1, no. 2 and small exhausters were used to draw gas from the retort house and pump it through the detarrer and purifiers and into the gasholders. Each unit consists of a horizontal single-cylinder steam engine coupled to an eccentric vane pump. The pressure of gas in the main controlled the speed of the engine through a governor which regulated the steam supply. The engines were manufactured by G. Waller & Sons Ltd of Stroud, England. The Reader Exhauster drew gas from the retorts and pushed it through the purifying plant and into the gasholders. It was used during the winter, when demand was high, as it had a higher operating speed and capacity than the older exhausters. The vertical single-cylinder, high-pressure engine was manufactured by E. Reader & Sons Ltd, of Nottingham, England. It drove a double-gear type Connersville exhauster manufac-tured by W. C. Holmes & Co. Ltd., of Huddersfield. The unit was bought second-hand from the West Midlands Gas Board in 1965, and is still painted in their colours.